Born in 1951 and living once again in her childhood home in Clontarf with sweeping views of Dublin Bay, Margo Banks was an artistically precocious child and began oil painting classes at 13 years of age. She moved to Spain where she met her late husband Miguel with whom she had three sons. Fifteen years later she returned to Dublin and Clontarf with her three young children and worked hard at developing her art practice. She initially worked in ceramics; building a kiln in her garage and from there moved into bronze sculpture, before returning to drawing and painting. With each medium, she enjoyed early success, and has shown for many years at the Royal Hibernian Academy and Royal Ulster Academy; amongst many solo shows. Her work now sits in private collections across Ireland, the UK and Holland, as well as the Office of Public Works, Enterprise Ireland and Cill Rialaig Arts Centre. 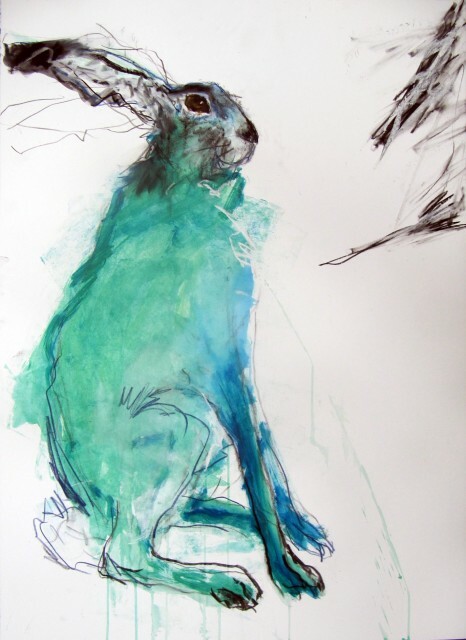 She has shown her lively charcoal, chalk and crayon animal drawings very successfully with the Solomon Gallery for over two years. These large scale mixed media drawings on the highest quality Fabriano paper owe a huge debt to her modelling experience as a ceramic artist and sculptor. They are charming and original and while being wholly contemporary in their composition also maintain a timeless quality .